Dry fenugreek leaves or kasuri methi is something that I have never associated much with south Indian cooking. It just seems that every time I reach for the kasuri methi I am planning to make something like this methi thepla or some of the numerous kinds of north Indian curry that uses kasuri methi. On the other hand the use of methi seeds is far more common in south Indian cooking and these seeds make their way into everything from dosai to sambar. Soak the first three ingredients together in sufficient water for 5 hours. Grind in batches along with ginger and green chilies in a blender/ mixer to a smooth batter of pouring consistency. When in doubt err on the side of a thicker batter, you can always add a little water later on to get the right consistency. Add salt to taste to the batter and mix well. Soak kasuri methi leaves in very little water (just 2 to 3 tbsp of water) for about 10 minutes. Heat a flat pan/ griddle/ tawa. Pour a little batter in the center and quickly spread into a thin circle. 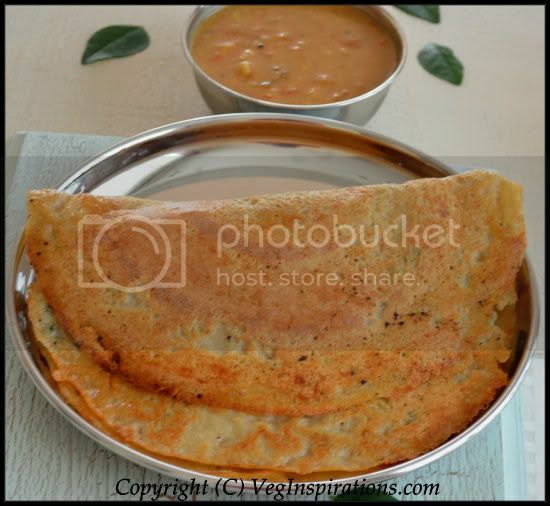 Pour a few drops of sesame oil around the circumference of the dosai. Allow it to cook, when the lower side turns golden brown, flip over and cook the other side until it gets small golden brown spots. Refrigerate unused portion of batter and use within a few days for best freshness.